Tickets available through Deveney's of Dundrum, via PayPal on this blog or through selected specialist Off-Licences. Ticket Price - €20.00 each. Ticket holders receive 5 complimentary ''Beer punts'' on arrival. The festival Beer Book and Tasting glass. 1 ''Beer Punt'' = 1x140ml beer serve. Additional ''Beer Punts'' available to purchase through the ''Beer Bank'' at €1.50 each. The event is run on ''Beer Punts'' only. 14 Beer stands with a total of 200 Premium Bottled Beers from around the world. Entertainment by ''Prison Love'' and Suzanne Purcell. Food vendors on site serving good beer food all evening. Experience Premium bottled beers this summer in Dublin. 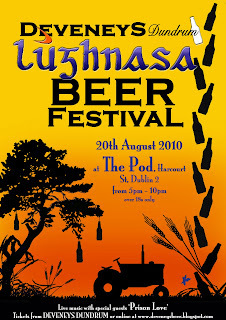 Labels: Preview of the Lughnasa Beer Festival. Got my tickets and can't wait Ruth!!! Roll on the 20TH!!!!! Sean. hell yes. Once this toothache goes away I am looking forward to the Liefmans and la Chouffe particularly.